Corporate culture is at once pervasive and invisible. Anyone who has worked in more than one organization (or suffered through a merger) can attest to palpable differences between how/if we celebrate birthdays, how/if we deal with poor performers and a million other particularities in the given context, all of which are clearly understood to all involved. Itemizing such particularities could be work for another day, but let’s focus on what is “good” and “desired” in a corporate culture. Such discussions always involve some disagreements. This same variance in personal preference will be found in any commentary on preferred work environments. Too much conflict/not enough conflict; too many rules/not enough clarity; too much bureaucracy/not enough rigour; too formal/too informal; too unforgiving/too lenient, etc. Some of these oversimplified critiques help to illustrate important areas that need to be balanced; two of these relate to conflict and ambiguity. I have recently had my drawn attention to “signage,” whose role should be to reduce ambiguity (by stating a practice) and, by logical connection, to reduce conflict (because the rule is now clear). Rules 1 & 2: Doubtless that an unclaimed mouldy sandwich brought this issue to the forefront. Rule 4: Ah yes, stockpiling. My guess is that someone went to Costco on the way to work and tried to put 48 single serve yoghurts in the fridge (maybe only for a few hours). Rule 5: How many spills were left unattended and for how long? 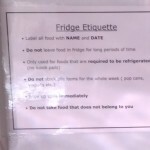 Rule 6: What was the extent of the lunch thievery or was this a preventative measure? Rules can be fantastic at reducing ambiguity, but only if everyone follows them. Compliance necessitates a dance between the practicality of the rule and its enforcement. 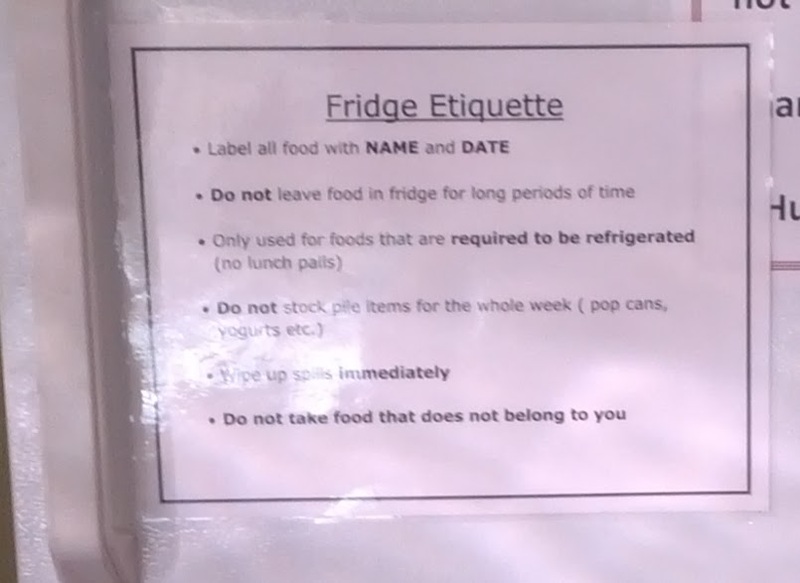 For example, one might question the practicality of asking people to disassemble a packed lunch bag and remove only the items that will pose a Health and Safety threat if left unrefridgerated for 3 hours. Diagnosing a corporate culture takes time and perspective. This can make it hard to do from the inside. A look at “signage” can be a quick place to start to get the pulse of how as a group we use this means to try to reduce ambiguity and conflict. To fully unleash the power of the Internet, I offer a standing invite to share signs you have seen or look at everyday. Good, bad, ugly, etc. This entry was posted in The Role of Rules and tagged Collaboration, Corporate Culture, Organizational Development, Rules and Ethics, Workplace Rules on April 27, 2015 by chris493.